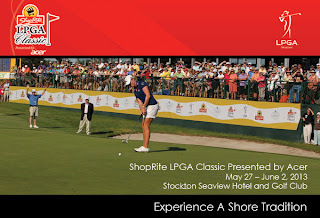 Galloway, NJ (May 7, 2013) — The ShopRite LPGA Classic Presented by Acer has announced that the Rolex Rankings top 10 players in the world along with 97 out of the top 100 players on the LPGA’s money list, have committed to play. Tour leaders, Rolex Rankings No. 1 Inbee Park and 2012 returning Tournament Champion and Rolex Rankings No. 2 Stacy Lewis, will challenge the field of 144 professional golfers scheduled to play. LPGA professionals have until 5:00 p.m. on Tuesday, May 28 to officially commit to the event with championship play beginning Friday, May 31 on the Bay Course at Seaview Hotel and Golf Club. The entire ShopRite LPGA Classic Presented by Acer field will bring out the best in competitive play as all battle for top honors. To-date, 22 Major winners have committed to play including: Cristie Kerr, Britanny Lincicome, Na Yeon Choi and Jiyai Shin. Returning fan favorites include: Lexi Thompson, Michelle Wie, Paula Creamer and Natalie Gulbis as well as Hall of Famers Juli Inkster, Karrie Webb and Se Ri Pak. International stars vying for this year’s title include: Yani Tseng, Suzann Pettersen, Ai Miyazato, and 2012 LPGA Tour Rookie of the Year, So Yeon Ryu. “We are thrilled to have early commitments from so many of the best players in the world,” said Tim Erensen, tournament executive director. “It speaks to the quality of this tournament, the spectacular course and supportive fans,” he added. Also announced are this year’s two sponsor exemptions; 2013 LPGA rookie, Marina Alex and popular LPGA veteran, Christina Kim. They will have the opportunity to compete in the 54-hole official LPGA event with a $1.5 million purse. Both players are familiar with the historic Bay Course at Stockton Seaview Hotel and Golf Club. Alex was a recipient of a 2012 sponsor exemption and Kim will make her 9th appearance at the event this year. “After Marina's performance both on and off the golf course last year we were delighted to give her another chance to compete in her home state,” said Tim Erensen, tournament executive director. “Christina is always one of the first LPGA players to step up and help out an event, sponsor or fellow player and when it was determined she needed an invitation to come back to Seaview it made both of our selections very easy,” he added. Wayne, NJ native Marina Alex made her LPGA Tournament debut at last year’s ShopRite LPGA Classic Presented by Acer and her first cut, finishing tied for 40th. In 2012, she competed in seven events on the Symetra Tour, recording two top-10 finishes and a season-best tie for 3rd at the Challenge at Musket Ridge. Alex was twice named SEC Player of the Year while playing at Vanderbilt University, and was selected as a National Golf Coaches Association First-Team All-American (2010 and 2012). As a sophomore, she was the individual winner at the 2010 SEC Championship and was runner-up in 2012 as a senior. Christina Kim grew up in San Jose, CA and is one of the most popular LPGA players worldwide due in part to her vivacious personality, attention-grabbing style and distance off the tee. Since her 2002 pro debut, she has had two career LPGA victories. In 2004, she became a Rolex First-Time Winner at the Longs Drugs Challenge. In 2005, Kim won her second LPGA Tour event at The Mitchell Company Tournament of Champions presented by Kathy Ireland Worldwide. To-date, she has 42 top 10 finishes and can boast career earnings of $4.1 million. The Solheim Cup, which will be held in Colorado this August, features the best U.S.-born players from the LPGA and Kim has represented the U.S. team as a participant in 2005, 2009, and 2011 with a 6-2-2 overall record, 3-0 in singles matches. All three rounds of championship play will be televised live on Golf Channel. For the latest tournament news, information and field updates, visit ShopRiteLPGAClassic.com.